This was a quick trip up to perform a battery load test. At the time this test was done we had some spare batteries provided by Greg, N7RIA in place at the repeater site. With the old batteries at my house I was able to put them through a few full charges and then test them with a load. We measured the repeater standby current draw at about 1/3 amp. 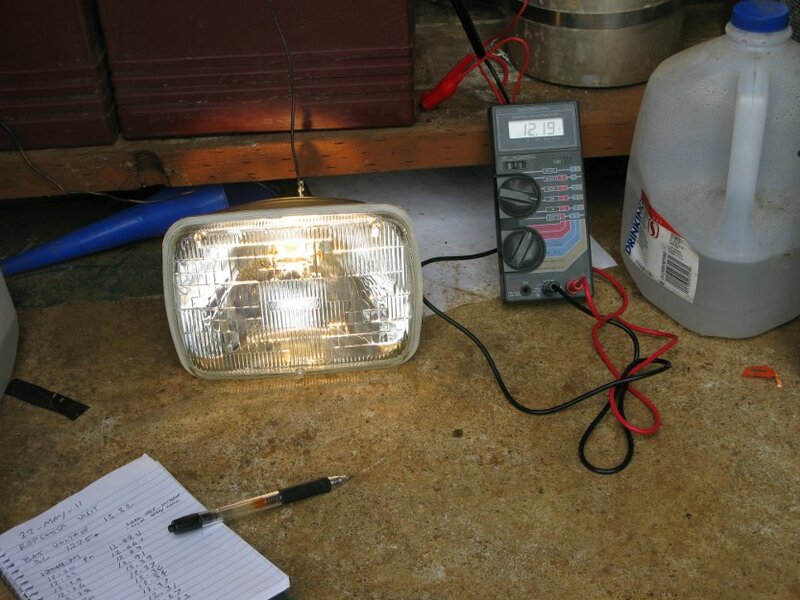 I used a car headlight to test the old batteries after a full charge. On this repeater visit the day was sunny and the time 12:30 PM. 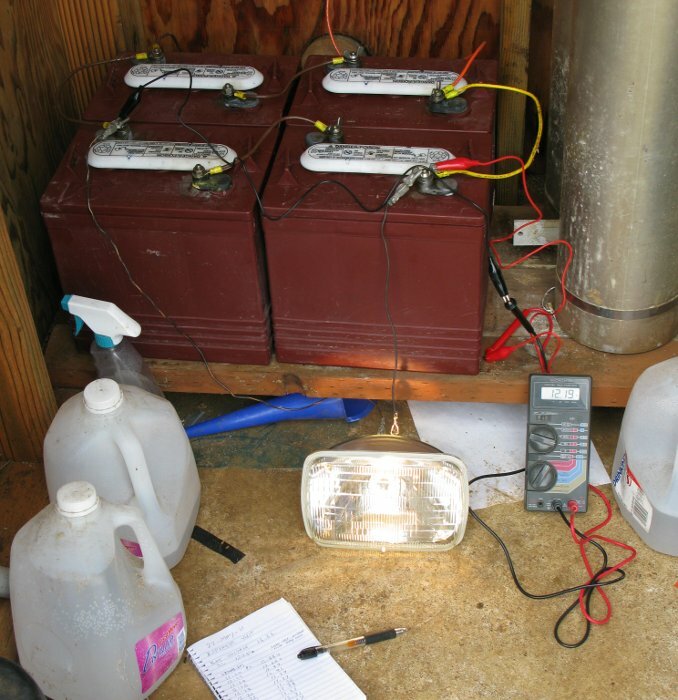 The batteries indicated a voltage of 13.32 volts and specific gravity of 1.275. The charge controller indicated that the batteries were fully charged. For the test the solar panels were disconnected so that the batteries would not be charged while the test was performed. A car headlight was used as the load, with the high beam drawing 4.7 amps. Test setup photos at the bottom of the page. Listed below are three battery tests. Test #1 - Our repeater batteries that were purchased October 2007 after they were brought down to my house and put through some charge & discharge cycles. The test used a 2.35 amp load for a total of 30 hours (70 amp hour draw). Test #2 - The spare set of batteries tested at the repeater site on May 22. Test was on a sunny day with the charge controller disconnected during the test. The batteries read 13.32 volts with no load but very quickly fell to 12.88 volts when the test was started. The load was 4.7 amps and times are minutes. Total draw was 2 amp hours. Test #3 - The spare set of batteries after they were returned to my house and put through some charge & discharge cycles. Test was done July 29th and used a 2.35 amp load for a total of 24 hours (56 amp hour draw). Note: The loads that I have listed are approximate. I am using a car headlight (high or low beam) as the load. The current draw will vary a bit as the battery voltage changes. 1) With both the repeater batteries and the spare batteries charged by a commercial charger we can pull a fairly large number of amp hours from the batteries without dropping the voltage greatly. 2) The batteries as charged with our current charge controller are not able to deliver anywhere near the amp hours that we get when using a commercial charger. Based on the tests I am recommending a charge controller upgrade to an MPPT (Maximum Power Point Tracking) solar charge controller and wiring our two south facing panels in series and our two west facing panels in series. My recommendation is the TriStar MPPT 45 charge controller (model TS-MPPT-45). This will meet our needs and provide capacity for additional solar panels should we ever wish to add more collection capacity. A two page data sheet can be viewed here and the full 68 page manual can be viewed here. Back to amateur main repeater page.